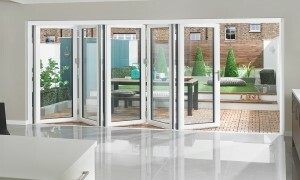 This Concealed Hinge Bifold Door is a BRAND NEW product and is now available to order. 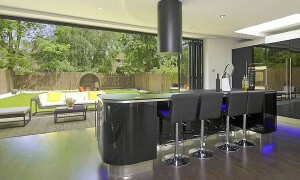 Slim polyamide thermally broken aluminium bifold door profiles, meeting stiles of 135mm. Unobtrusive concealed hinges – provide clean unbroken lines for your bifolding door. High security shoot bolts to all intermediate panels; hold the bifolding doors firmly in place. Specially designed flush-line intermediate handles are recessed within the frame, allowing for very tight stacking panels. These doors come with superior locking cylinders rated PAS-24 for advanced security, as standard. High quality stainless steel bogie wheel assemblies run on a stainless steel track, ensure continuous ease of operation for years to come. NEW Oak wood structure paint finish available on this product. 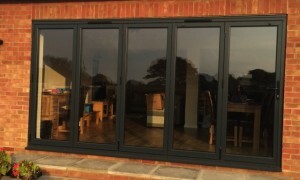 Please call us to arrange a visit in the comfort of your own home to discuss these options further, whether you are looking to replace your existing opening with some bi-folding doors or maybe you are considering some home improvements and extending your home, we can incorporate bifolding doors to fit in with any surroundings. If you are living in Hampshire or any of its surrounding areas such as Alton - Alverstoke Alderholt Basingstoke Burridge - Bursledon Crampmoor - Crawley Durford Wood - Durley Empshott - Emsworth Hambledon Ringwood Southsea - Southwick Upton, Nursling Perham Down - Petersfield or Overton please call us now on 02392 413999.